As the last official phase of the Connected Courses comes to an end, there is ample discussion among participants on the question of: Why does a connected community end just because a course ends? 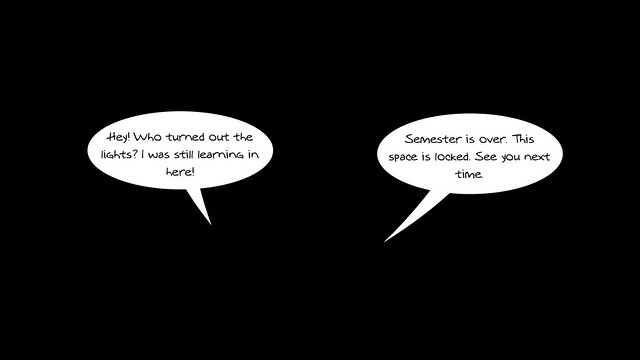 (And why does an online course end when a traditional semester ends?) 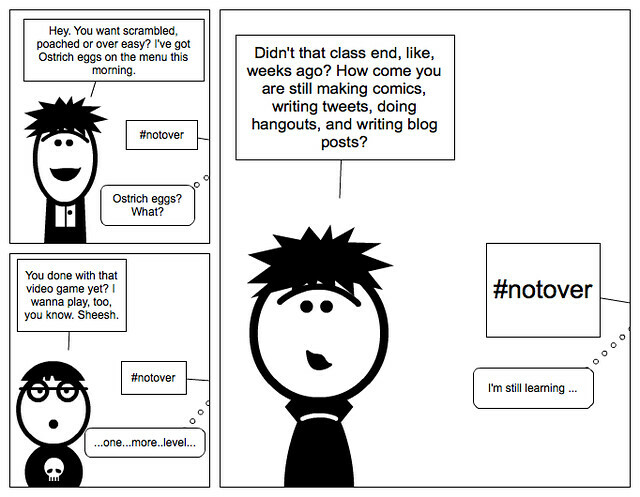 The #notover hashtag is being used, which I used for the comic above. 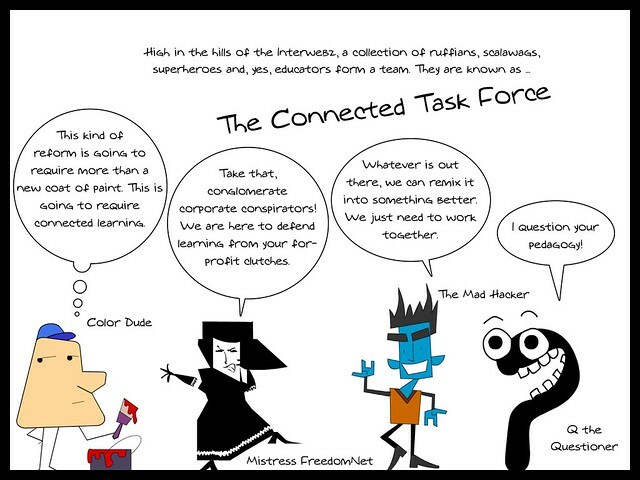 I’m reminded a bit of another comic I made for Alan Levine earlier in the Connected Courses, as he mulled over this same topic, and I reflected on an LMS I am in right now that I don’t care more than a whit about. He put forth the idea of “keeping the lights on” and not using language about anything ending. So many folks are plotting ways to keep people connected. There was even talk of a task force. Made a comic. (Surprised? I doubt it). 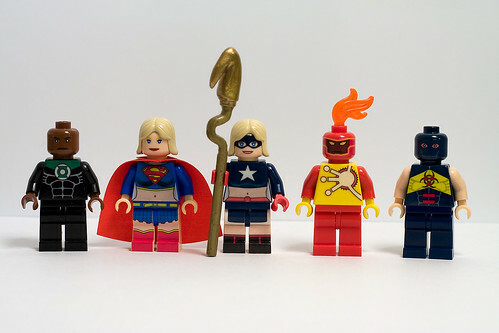 I was thinking of superheroes. Personally, I like the Mad Hacker. 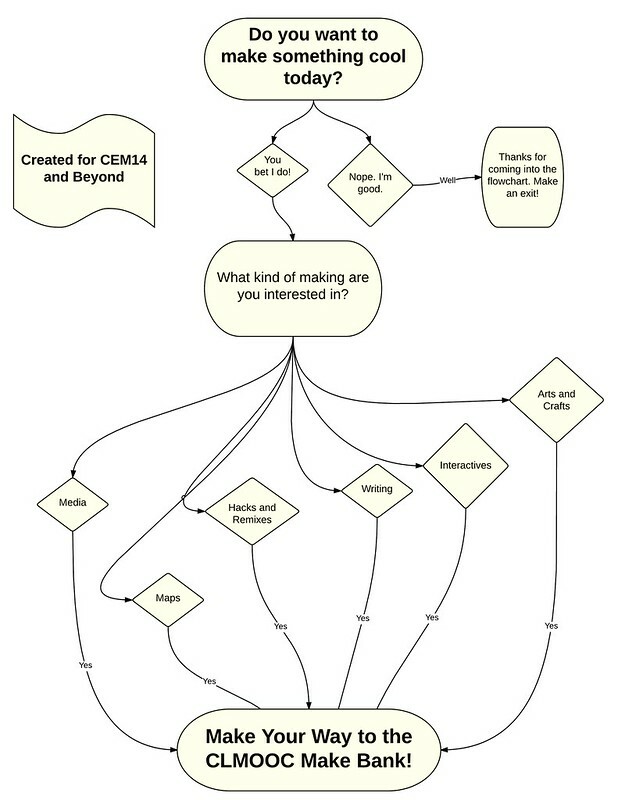 Just like anything of this nature, it will depend on the participants now, not the facilitators (although facilitators should now have permission to become participants) as to whether sharing, connecting and exploring continues under the #ccourses banner. 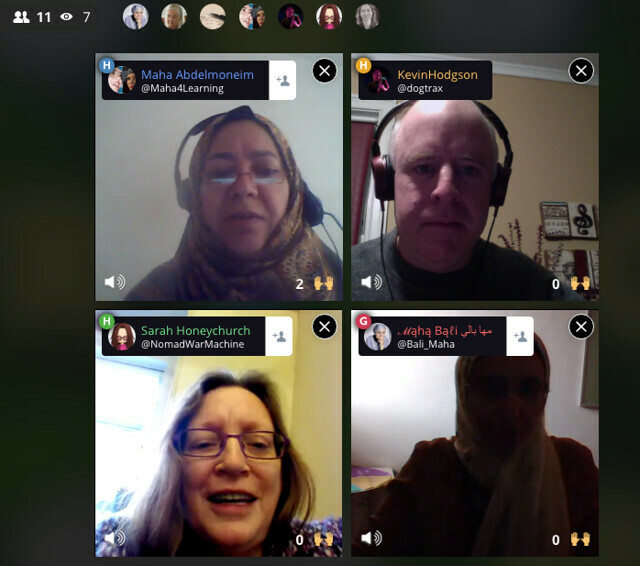 To be honest, the Connected Courses has been intriguing and I have enjoyed the discussions and hangouts and meeting people (I mean, I’ve been “hanging out” in spaces with Howard Rheingold and Mimi Ito and others … how cool is that? It’s a thrill). 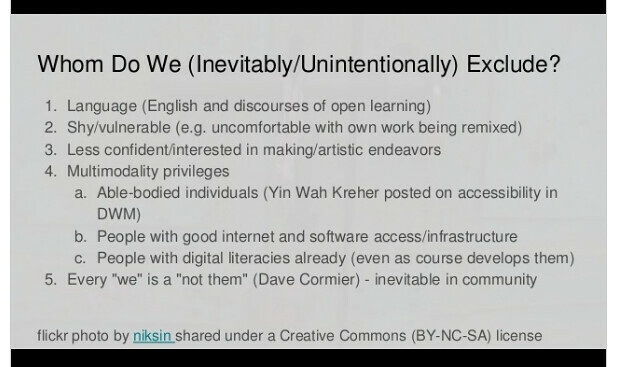 But as a K-12 teacher, much of the discussion about designing open education courses for the University level has been intriguing on a thinking level, but not all that practical on the day-to-day level. 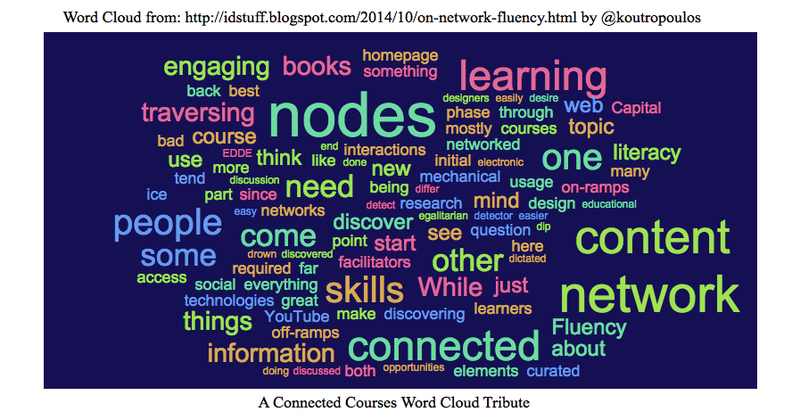 But you know, I am still in the rather vibrant #rhizo14 network (coming towards #rhizo15), and I connect with DS106 via the Daily Creates (our model for the Daily Connects), and the #clmooc community is still sharing in various spaces. A different, more relaxed energy comes when the planned world falls away, and the unknown maps of what is ahead takes place. Sometimes, it sustains itself. Sometimes, not. We’ll see where the #ccourses goes and time will tell if it is really #notover … but I do know that the people I have connected with there have greatly expanded my own online networks of friends I can turn to with questions and advice and projects, and ideas. And, of course, comics. 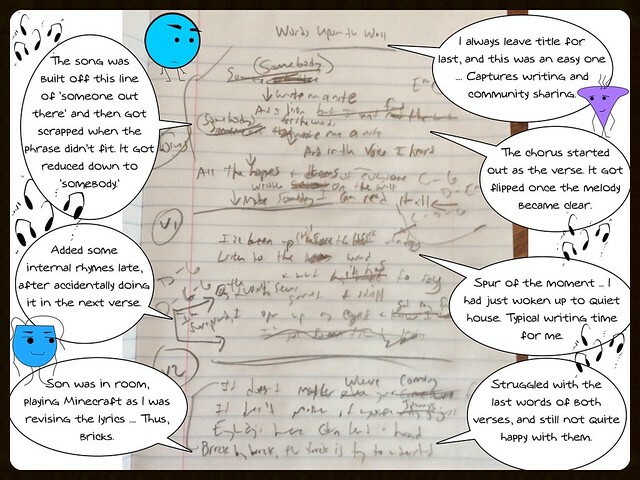 I made a ton of comics for Connected Courses, in hopes of infecting a little fun into the conversations. If you have not had the free and wonderful K12 Online Conference, you should. It kicks off today and runs for the next two weeks or so, but it doesn’t matter if you miss a day or a presentation since everything is archived online and readily available. You can even go back to the last few years of presentations via the archives. The K12 Online Conference is a powerful example of teachers sharing expertise and exploring the intersections of teaching, learning and technology, and more. There are themes of open learning and outside learning spaces, and more. Check out the 2013 K12 Online Conference Schedule. And here is the opening pre-conference keynote by Shannon McClintock Miller.